Dental needs change as we get older. Starting around the age of 65, you’ll face an increased risk of developing many gum and tooth issues which weren’t as likely to occur during your younger years. Your daily dental care routines will need to be modified to protect your oral health. Beyond changes to your dental habits, how you pay for dental care may soon change, too. Employer-provided dental insurance may be ending if you’re planning on retirement, and Medicare doesn’t cover dental. Navigating new ways to save on dental care can often seem complicated. Fortunately, great dental health is possible and affordable at any age. If you’re 65 or older, here’s what you need to know about keeping your teeth in great shape, and whether dental insurance makes the most financial sense for your needs. 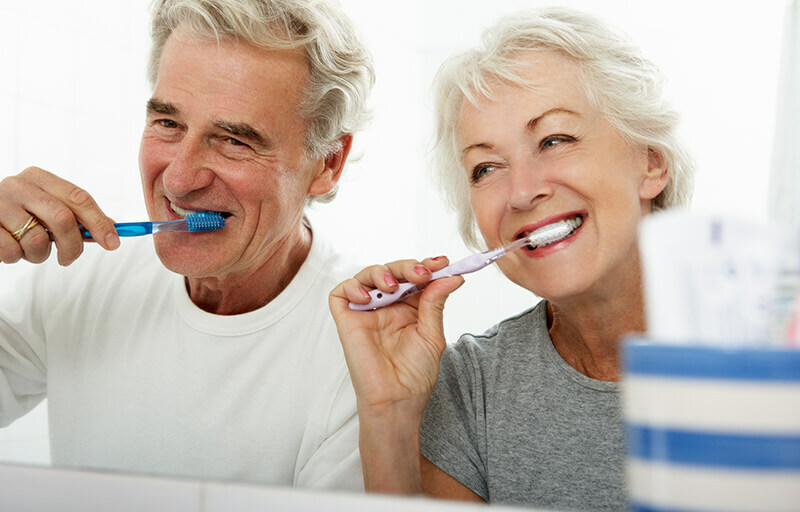 How Does Age Affect Oral Health? Teeth and gums generally become more vulnerable over time due to age-related factors. For instance, many seniors take a variety of prescription medications, many of which can cause chronic dry mouth. Over time, dry mouth increases your risk of developing cavities. But that’s just one example. Seniors also face an increased risk of developing gum disease, tooth alignment issues and many other dental problems. Regular dental check-ups take on increased importance as we age. Your dentist will want to carefully monitor your oral health. But even though you’ll still need to visit the dentist regularly, how you pay for dental care as a senior will likely be different than what you’re used to. Most private dental insurance is provided by employers. If you’re not already retired by the age of 65, you likely will be soon. For many people, retirement means the end of employment-based health and dental insurance. Does Medicare Provide Dental Coverage? Medicare is a federal program which provides health insurance for those over 65 as well as younger people with certain disabilities and various types of renal failure. Of the approximately 58 million people currently on Medicare, roughly 50 million are over the age of 65. However, Medicare doesn’t cover everything. Instead, it’s divided into four different parts. Part A mainly covers hospital stays and various types of nursing care. Enrollment in Part A is automatic. Part B covers doctor’s visits, diagnostic procedures and similar issues. Coverage is similar to most private health insurance policies, so many people with employer-based health insurance typically enroll in Part B upon retirement. Part A and B are commonly referred to as Original Medicare. Original Medicare does not provide dental coverage. Instead, it only covers what are called “medically necessary” procedures. The official definition for medically necessary rarely applies to dental issues. For example, if you suffer an injury to your face, Medicare would pay for emergency treatments to stabilize any damage to your jaw or teeth, but wouldn’t cover additional restorative care such as a dental implant. Is Dental Insurance a Good Option for Seniors? If you only have private health insurance or Original Medicare, you typically won’t have any type of dental coverage. But you still have options for purchasing dental insurance. If you’re enrolled in Original Medicare, you can purchase dental insurance through Part C. A variety of different coverage options are available. However, policies will have annual limits, premiums and other restrictions similar to private dental plans. Finding a policy is usually pretty easy, but might not meet your coverage needs. You can also buy private dental insurance. Many organizations such as AARP offer their members group rates for health and dental insurance, which can help lower costs. You can also purchase an individual plan from whatever provider you prefer. This allows you the most flexibility to find a plan which meets your needs, although costs can be high. Regardless of how you purchase dental insurance, there are still limitations to consider. Most dental plans have an annual limit between $1,000 and $1,500. That typically only covers one major dental procedure such as a root canal or implant. Plus, dental insurance often has a waiting period. Coverage for most restorative care only begins six months after purchasing the plan. Many pre-existing conditions, such as missing teeth, typically aren’t covered at all. Are Dental Discount Plans a Good Option for Seniors? Dental insurance doesn’t make sense for every senior. Fortunately, insurance isn’t the only way to save at the dentist’s office. Dental discount plans, also called dental savings plans, are an affordable, flexible alternative to dental insurance. Dental discount plans let you save between 10% and 60% on dental procedures at over 110,000 participating dental offices nationwide. While the exact amount will depend on the type of plan you purchase, generally you’ll be eligible for savings on a wide range of preventative, minor and major dental procedures. Even better, discount cards have no restrictions on pre-existing conditions. Because seniors can face many different age-related dental issues, the flexible coverage options of a discount plan can be very beneficial. Additionally, dental discount plans are also easy to use. Within just a few days after application, you’ll have a personalized dental discount card you can use right away. Simply present the card at any participating dentist for instant savings at the time of service. Plus, with no annual limits, you can use the card as often as you like each year. Many seniors prefer the simple, straight-forward savings of a dental discount plan compared to the sometimes-confusing restrictions of dental insurance. If dental insurance doesn’t make financial sense for you, other options such as dental discount plans are definitely worth consideration. Although dental care needs do change over time, having great oral health is possible and affordable at any age!